The town of Banff, Canada is an easy 1 hour drive on a 4 lane highway drive due west from Calgary. 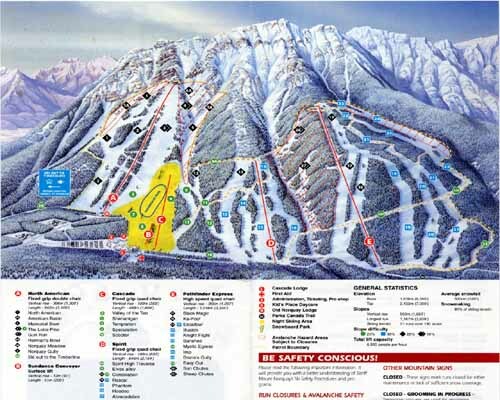 Within 30 minutes of Banff are the three ski areas of "Lake Louise", "Sunshine Village", and "Norquay". 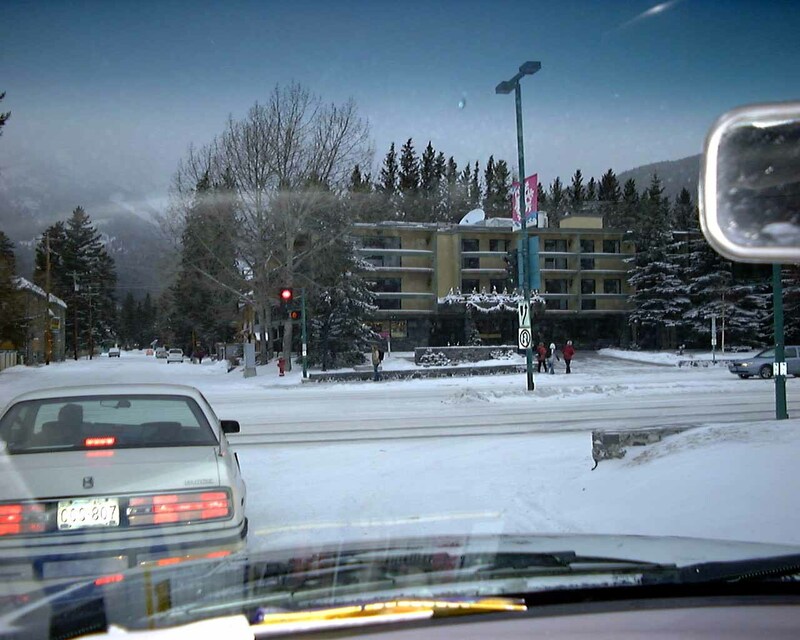 Although it is possible to travel to Banff without renting a car, it would be a big hassle. If you want to go this route, there is the "Banff Airporter" for about $40 Canadian one way (403) 762-3330. I would recommend staying in Banff and not at the local ski areas, since Banff has so much nightlife and the ski areas have so few services (maybe one bar and a restaurant in your hotel). Banff is a very cute, small, touristy town packed to the gills with bars, restaurants and nightlife. Click here for a picture of main street. There are probably 30 restaurants and bars in a tight 4 block radius. There are two "nightclub" type dance clubs in town, and they aren't worth seeing before midnight, but you should definitely check them out between midnight and when they close at 2am. If there is live music, check out "Wild Bill's" at the center of town, it can pack in quite a crowd. 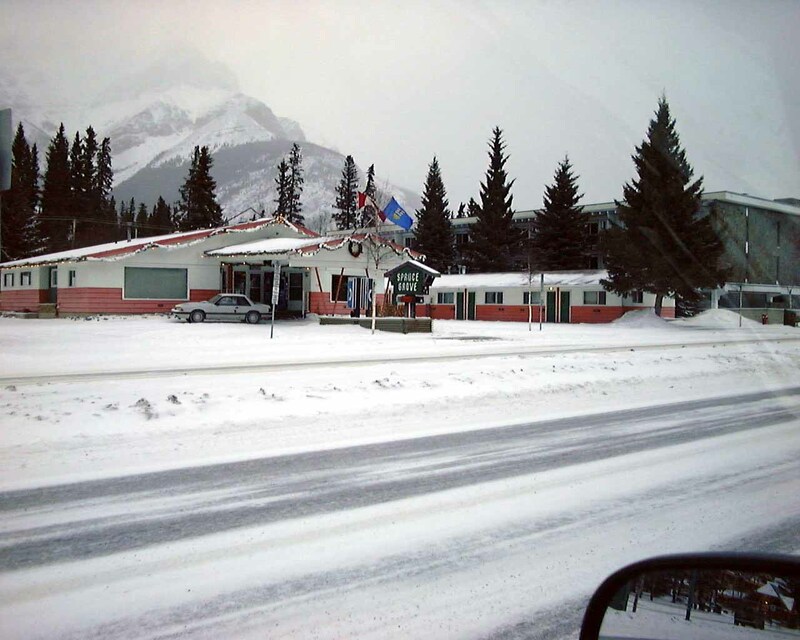 The cheapest hotel in Banff is the "Spruce Grove Motel", located a 15 minute walk from the center of downtown on Banff Ave. For $70 Canadian (about $45 US), you get a room with two beds that would accommodate two buddies easily. This is next door to several very nice hotels with restaurants where you can buy a nice buffet breakfast for around $10 Canadian. The two downsides of the Spruce Grove are that it is a long walk from downtown, and it is a simple, not very luxurious place with no fireplaces or kitchens. For a mid-scale hotel, the Traveller's Inn would be a good choice. Click here for their official website. For as low as $110 Canadian (about $75 US), you can a simple room with two beds, but only a 2 minute walk to downtown and a few more amenities such as hot tub, sauna, and restaurant. These rooms will be a little nicer than the Spruce Grove's rooms. If you spend an extra $20 Canadian to upgrade to the "Deluxe Room" you even have a sitting room. Still no fireplace or kitchen though. Also for a mid-scale hotel, the Banff Ptarmigan Inn would be a good choice. Click here for their official website. This is next door to the Traveller's Inn above, and has just a little bit higher pricing for a little nicer accommodations. 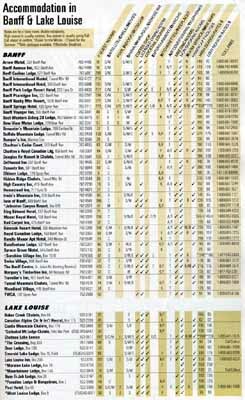 For the full blown kitchen and fireplace type of place, the Best Western for $200 Canadian (about $133 US) would probably fit 2 or 3 buddies comfortably and is a short 5 minute walk from downtown. Click here for their official website. If you are willing to walk 12 minutes to downtown, the Rundlestone Lodge (click here for their official website) is very nice. It has small rooms for as low as $100 Canadian ($65 US), but the best rooms would fit 4 buddies comfortably and have 2 bedrooms, fireplace, small kitchen, for $240 Canadian ($160 US). 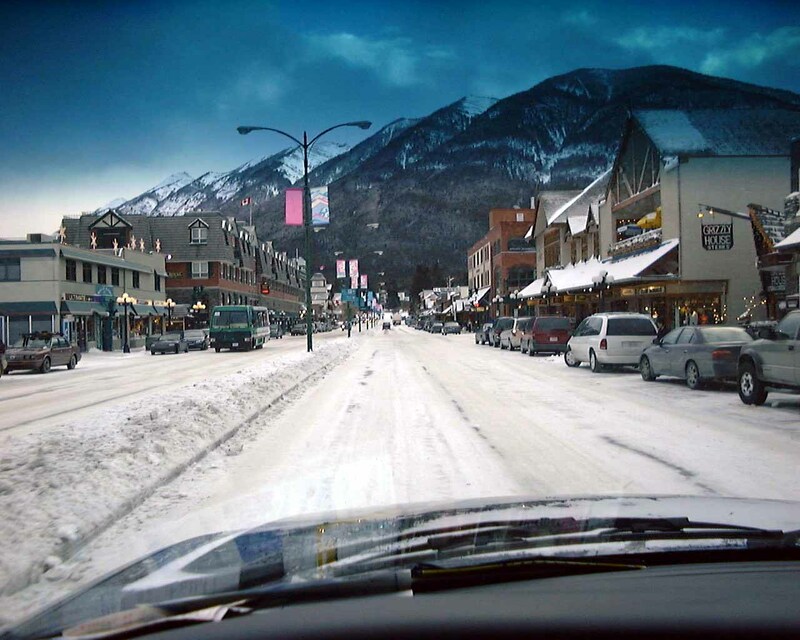 There are 3 ski areas within 30 minutes drive of Banff. 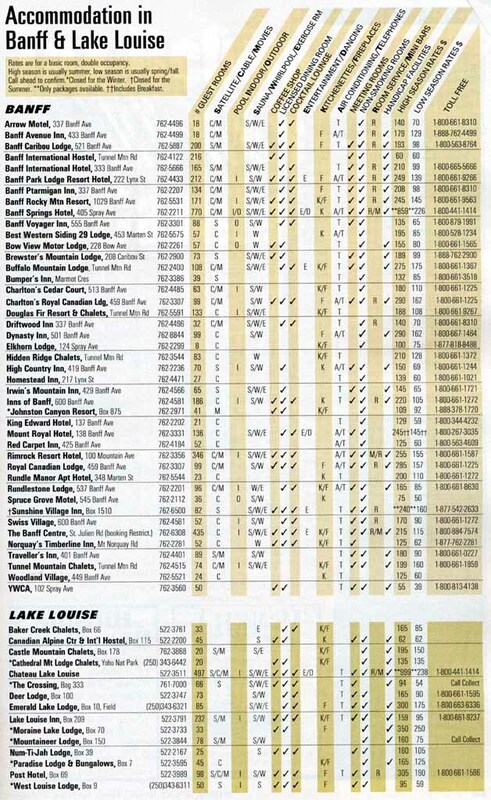 The most famous is "Lake Louise" and is the furthest away. 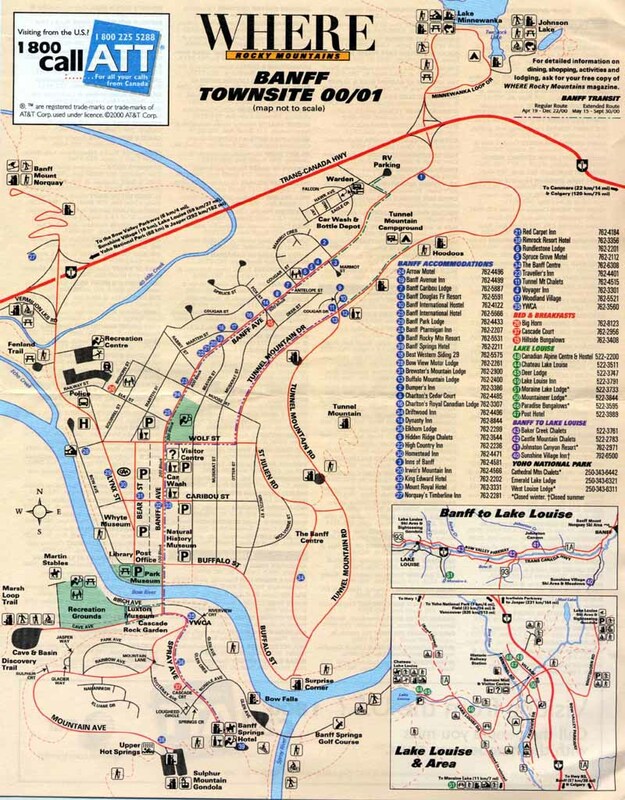 Here is a lift map (click on this lift map for a MUCH more detailed version involving many pictures). Click here for a gallery of images from skiing Lake Louise, Sunshine Village, and Norquay. 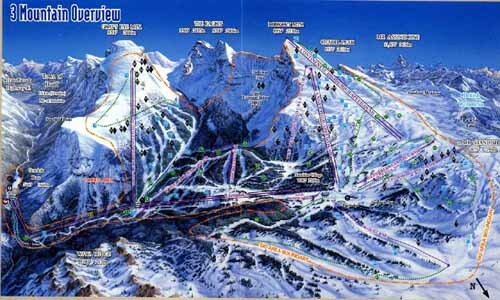 Sunshine Village ski area is about 20 minutes drive from Banff, and is as large as Lake Louise. The gondola is shockingly long, and the run underneath the gondola is a big long fun cruiser well worth taking down at the end of the day. 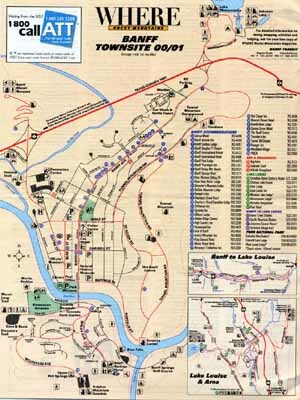 Click on the image below for a blow up version of this map. Click here for a gallery of images from skiing Lake Louise, Sunshine Village, and Norquay. Norquay is only 2 miles from Banff. 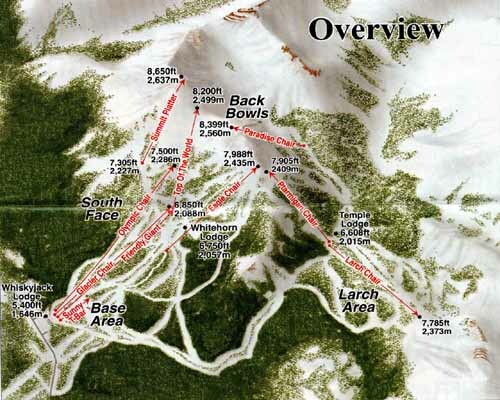 It is a small area, only worth skiing for a day or even a half day. Here is a lift map (click on the lift map for a much more detailed version). Click here for a gallery of images from skiing Lake Louise, Sunshine Village, and Norquay.